This is my third and last post showing the sneak peeks I did of a upcoming stamp set, Ribbon of Courage, at a recent Stampin’ Up! demonstrator meeting in Toronto. See Part 1 here. See Part 2 here. I made this adorable little package of note cards packaged in a glassine bag. These cards would be perfect as a gift for someone going thru a treatment or illness –someone who might have a need to thank their supporters for meals delivered or rides given. I used Stampin’ Up’s Glassine Gift Bags (these gift bags are on the retirement list and are in limited supply). 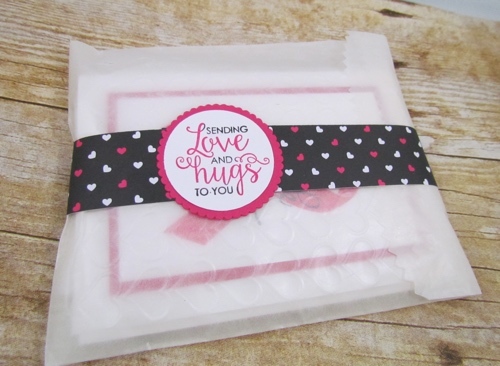 I embossed the bags with the Happy Heart Textured Impressions Embossing Folder. The belly band was made with the Pop of Pink Designer Series Paper, which is also on the retirement list and on sale too. Also on the retirement list is the crumb cake notes that I used below. Pick a cause in any colour as I’ve done on the note cards below. 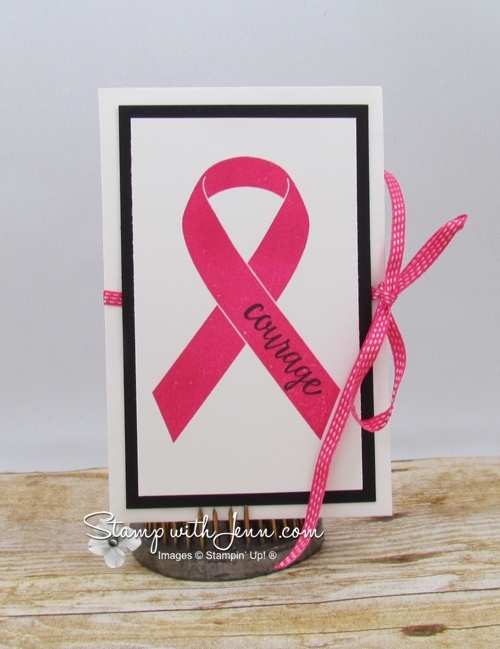 The final project I want to show you, using the Ribbon of Courage stamp set, is a gift card holder. A gift card, for a take out meal or a favourite store, is thoughtful gift for a friend going thru a tough time. Customize the ribbon colour to the illness. If you google “awareness” ribbons, you can see the various colours for various causes. Love how the word “courage” from the stamp set fits right into the ribbon. 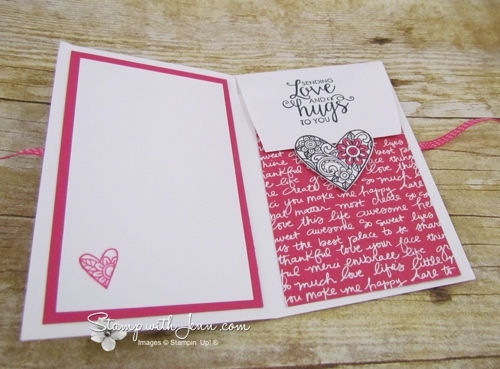 This gift card holder is made from a Stampin’ Up! envelope folded in half. 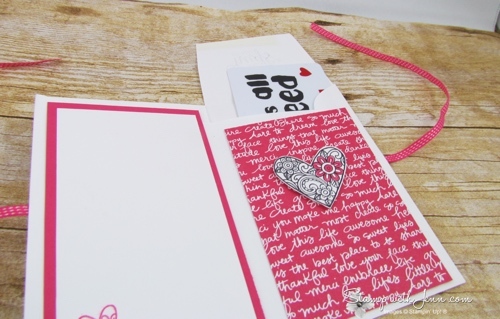 And uses the heart from the stamp set as a closure to hold one half of the envelope closed to form the pocket for the gift card. If you like gift card holders, be sure to check out my Creative Gift Card Packaging Class. I hope you enjoyed this sneak peak of the Ribbon of Courage stamp set. Check back to www.stampwithjenn.com again for other sneak peeks of the new 2017-2018 Stampin’ Up! Catalogue! And click here to put your name on my list to get your own copy of the catalogue.